For Channel 4’s THE ROUGH GUIDE TO CHOREOGRAPHY, Mike and Billy set out on a quest to demystify the dark art of choreography and en route, attempted to pick up some of the tools of the trade. 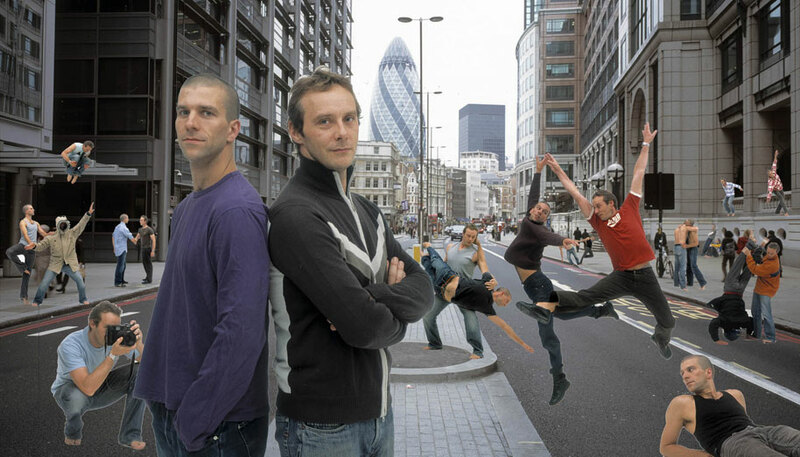 During successful careers at the Royal Ballet, and now as George Piper Dances, Michael Nunn and William Trevitt have worked with the world’s greatest dance makers. Their journey took them from the streets of New York to the mountains of North Wales. They cajoled pearls of wisdom from the leading lights of contemporary dance and classical ballet, to the hottest disco movers and tai chi masters. And at the end of this odyssey, the boys had to come back to London to create a brand new piece to be performed at a Gala Evening at the Barbican Theatre in July 2004. Programmes 1-3 follow the boys as they hang out with street capoeira dancers, and take Justin Timberlake’s choreographer for a night at the Opera House… and learn a few moves back in return. Programme 4 comprises the gala evening at the Barbican Theatre at which the great, the good, and the television audience get to see the world premiere of Mike and Billy’s new work. The book, ‘The Rough Guide to Choreography,’ accompanies the series.